The giant TS-1677X is powered by an AMD Ryzen™ processor with up to 8 cores/16 threads. When used with a high-end graphics card, the TS-1677X delivers incredible computing performance to empower data-intensive machine learning applications. The AMD Ryzen™ processor, with Turbo Core of up to 3.7 GHz, can greatly boost virtual machine performance. The TS-1677X provides cutting-edge capabilities to help organizations develop cost-efficient AI-oriented big data storage solutions. Combined with a high-end graphics card, SSD caching, and QNAP's "QuAI" AI developer package, the vast data stored on the TS-1677X can be leveraged to quickly build, train, and optimize AI model-based services, beneficial for exploring intelligent services and greater business value. Powered by a high-performance multi-core AMD Ryzen™ processor with AES-NI encryption acceleration and up to 64GB DDR4 RAM, the TS-1677X delivers aggressive yet power-smart performance to meet your multitasking demands, including running multiple virtual machines simultaneously. For resource-demanding business applications such as VDI, R&D, private cloud, and server virtualization, look no further than the TS-1677X. The exceptional hardware of the TS-1677X bolsters overall system performance. Coupled with the flexible and expandable architecture, the TS-1677X fulfills diversified application needs. The TS-1677X offers not only four Gigabit Ethernet ports but also two 10GBASE-T RJ45 ports to fully support 10GbE high-speed networks and accelerate applications such as virtualization and on-the-fly video editing. The 10GBASE-T RJ45 ports also support 10G/5G/2.5G/1G/100M speeds to fulfill various bandwidth demands. Graphics cards are optimized for graphical calculations and transformations. The TS-1677X provides a 550 watt power supply to ensure compatibility with high-end graphics cards that can greatly empower applications including data-intensive AI machine learning, imaging processing, and virtual machine performance (via GPU passthrough). When watching videos with the TS-1677X, you can use the remote control ( RM-IR004, optional purchase) that supports QButton for a more convenient control of your multimedia experience. PCIe expandability allows for graphics cards, 10GbE/40GbE adapters, QM2 cards, USB 3.1 10Gbps cards, or wireless network cards. Supports AMD Radeon™ and NVIDIA® graphics cards for AI-computing, video processing or GPU-passthrough to VMs. Dual 10GBASE-T (RJ45) ports accelerate virtualization applications and high-resolution video editing and sharing. RAID 50/60 is recommended for NAS with over 10 disks to strike a balance between capacity, protection, and performance. Enables lightning-fast throughput for bandwidth-demanding tasks such as virtualization, massive data transmission, and fast backup/restoration. Add M.2 SSD caching or 10GbE (10GBASE-T) connectivity to the NAS for optimized performance. Accelerates NAS video processing and GPU computing, empowers AI machine learning, and supports GPU-passthrough to VMs. Works with WirelessAP Station to transform the NAS into a convenient wireless base station, allowing network resources of the NAS to be shared with multiple devices. Use the free QNAP NetBak Replicator utility to backup/restore Windows® files. Time Machine® is also supported for Mac® devices. Consolidates backup, restoration and synchronization functions (using RTRR, rsync, FTP, CIFS/SMB) for easily transferring data to local, remote and cloud storage spaces as a comprehensive data storage and disaster recovery plan. Snapshots are essential for NAS data protection, and its block-level operation makes it a dependable method for mitigating the growing threat of ransomware. The TS-1677X supports up to 256 snapshots per volume or LUN, and maximum 1,024 snapshots per NAS. With potentially huge storage capacities, high performance, integrated virtualization solutions, and support for snapshots that record the state of the system at any time, the TS-1677X is perfect for backing up virtual machines. 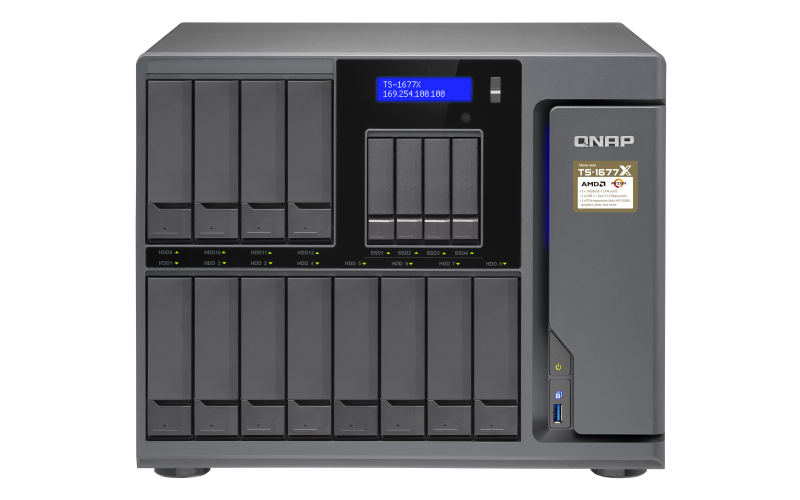 Download the QNAP TS-1677X Specification Sheet (PDF).